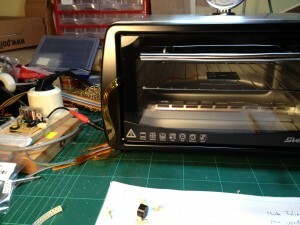 This is reflow soldering controller for use with a toaster oven as reflow soldering oven. I bought the toaster oven in a local super market for about 40 €. There was also a cheaper oven on sale, but I wasn’t sure if it did 250°C, so I bought the more expensive and prettier one. 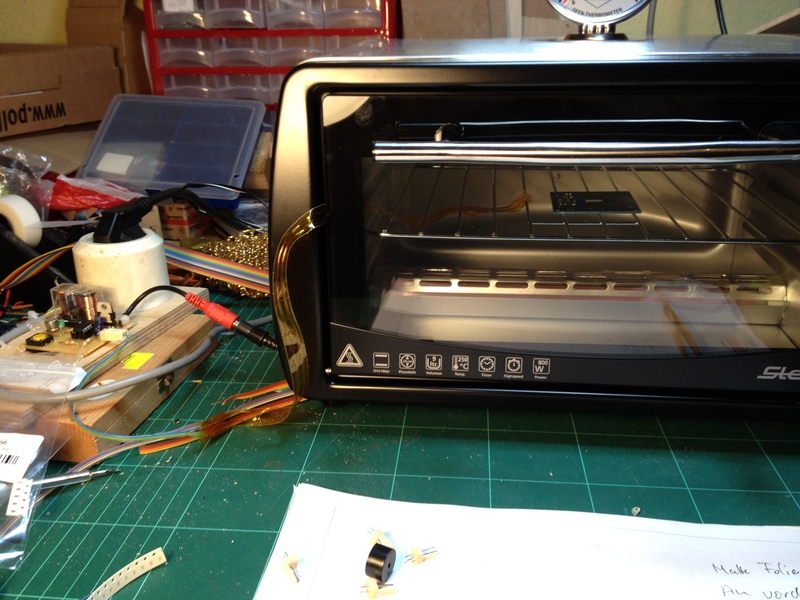 Since I don’t want to loose the warranty and also haven’t any interest of the oven’s internals, I designed the reflow controller as an oven-external device which directly switches the oven’s mains on/off. 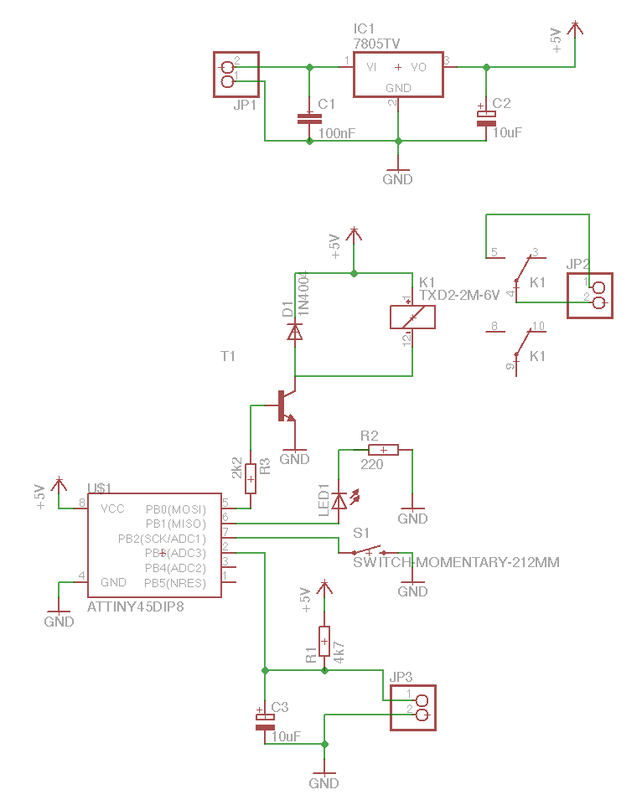 The relay I use is for 6V, but it seems to work just fine with the 5V supply from the ATtiny. On the mains side, the relay is rated for 230V/16A. 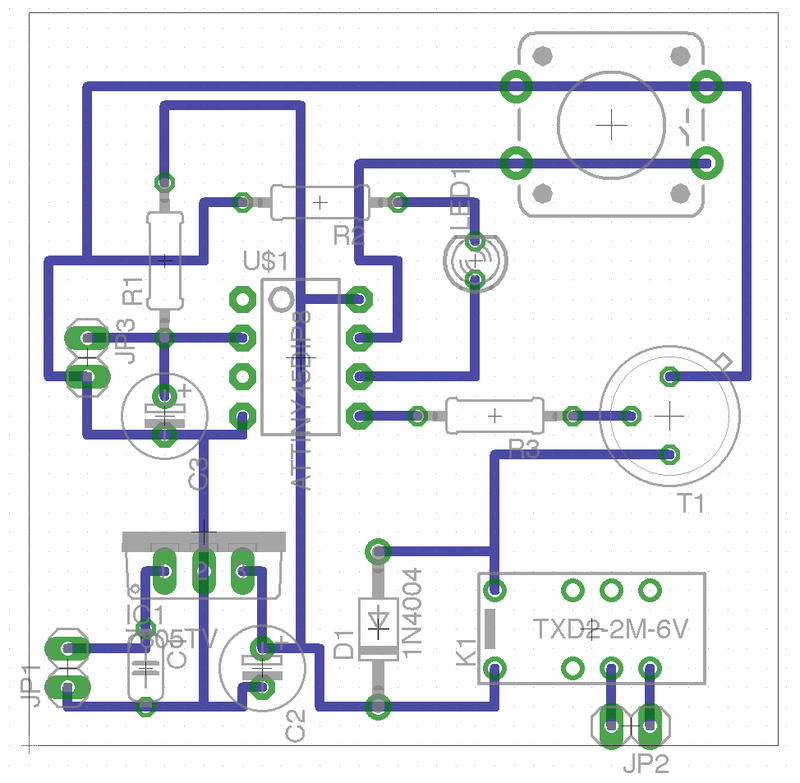 The whole controller is based on a ATtiny 45 µController. I use one pin as input for the 100k thermistor for temperature measurement (connected to JP3), one pin controls the mains relay (via a BC140 transistor), one pin controls a LED for feedback and one pin is connected to a switch for user input. 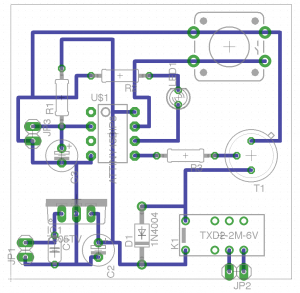 Disclaimer: If you plan to build such a thing, be aware that 220V (or 110V) are involved in this circuit. That voltage potentially kills you. So be careful and don’t do it if you’re not sure, what you’re doing! I managed to pack full PID controlled temperature management, 3 “programs” and a minimalistic UI into the 4k program memory of the ATtiny 45. The temperatures and holding times are easily changeable in the firmware code. There’s a second program (2), holding 110°C for about 1 hour (great for drying stuff) and a third program (3), switching the oven on for virtually forever. The latter might be used for driving the oven with it’s build in bi-metal temperature control in arbitrary situations (without unplugging the controller). After connecting the oven and the controller, press the controller’s button to switch the program. The active program is indicated by the LED, blinking 1, 2 or 3 times. To start the selected program, press the button longer than 1 second. After the third phase, the LED is switched on continuously. This means, you can open the oven’s door to speed up the cooling progress. When the oven’s temperature falls below 55°C (i.e. it’s save to touch the PCB), the LED is switched off and the program is reset. You can abort any program by pressing the button. The current firmware uses 4084 bytes of the available 4096 byte maximum of the ATtiny 45. 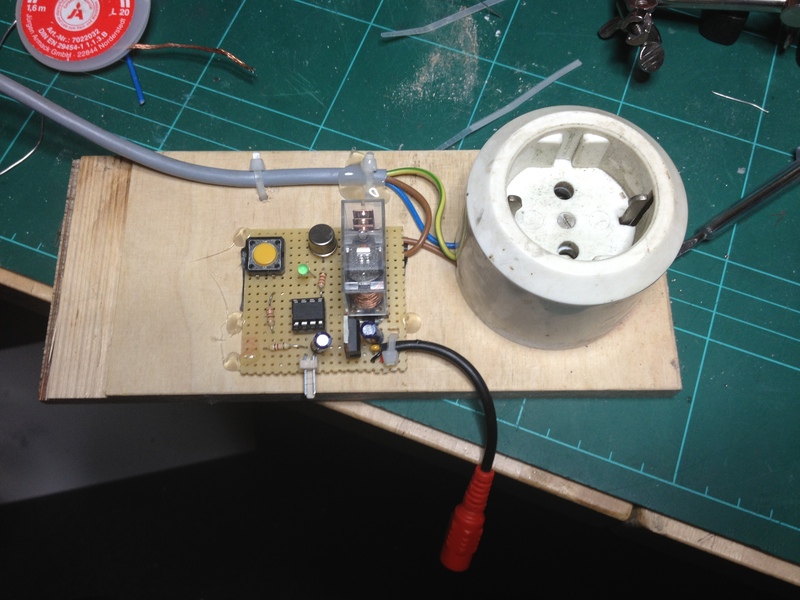 To program the ATtiny, I used the procedure described at the high-low tech blog. Since the temperature profile of each type of thermistor is different and might require some calibration or rewrite of the program, what specific thermistor did you use for your project? Great project. I’d also like to know the thermistor model please. Regards. Honestly, I’m not sure which exact model I had in stock. It was one of these “RepRap” thermistors. See here for a selection of those (including their thermal properties). Thanks for your reply, it is enough to know it was the type used in RepRap / 3D printers.